Yesterday i had a shoot with Noelle Wells. We had planned to go on location to some ruins in the desert a little past Two Guns, Ariz.; however, despite the up-till-now mild winter, Flagstaff is back with a vengeance and we have received about 9” of snow in the past day. So, with our location out of the question, and still needing to shoot this week, we moved to the NAU studio to get creative with backdrops to achieve the feeling I was after. It’s kind of an adventurer/archeologist thing; you might be stranded, but at least you’re still fashionable. Keep reading to see some finished shots and how it all happened. First i will get the technical stuff out of the way, for those of you who don’t care skip to the next paragraph…If you are still reading, good, here it is. The top photo shows the high-key set up. It is a strip-box with 2 CTO gels as the key camera left. Out of the frame just to the right is a 5′ octa-box as an big on-axis fill. Sam is setting up a light with a 20 degree spot-grid. It serves double duty as a rim-light on the model and to illuminate the set. Not seen in the background are two lights with reflectors pointing at the wall to blow it out to white. 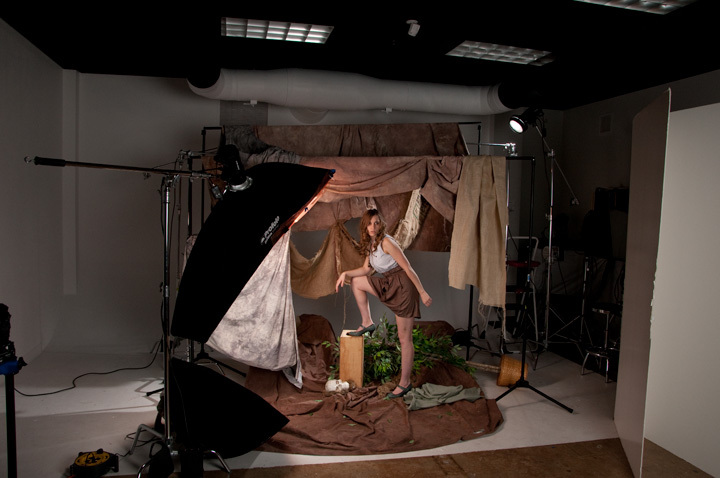 The second, low-key set up is the same, minus the two background lights with the addition of two reflectors. Now that we are all back together in paragraph two…This was a very fun shoot, that came together in a hurry and achieved the same feeling i was after without having to leave the comfort of the School of Communication. A very Hamlet moment as our heroine examines a found skull. 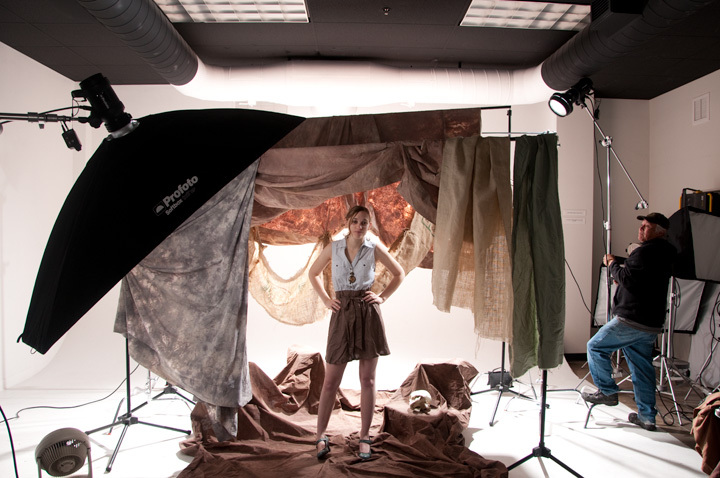 The studio has lots of cloth backdrops, i hung a giant muslin from two background stands, hung various pieces of fabric in the color palette i wanted from the stands as well. I added another dark muslin for the ground with a few apple-boxes for form and that was it. By the time we switched from the high to low-key look i had added a tree from the student media center, and emptied the contents of it’s pot onto the ground as well. Noelle is also a photo student, check out her website here. We have had a few classes together in the past and she has stood in front of my lights a time or two as well. She is always a lot of fun to work with and brings good energy to the shoot. It is nice to work with people who don’t just clam up in front of the camera, a good model make all the difference, thanks Noelle. If i had known that this shoot was going to be in the studio the whole time, i probably would have done a few things differently. For one, i would have purchased some more Spanish-moss and probably brought in a bag of yard mulch for the floor. Also, i would have arranged for critters, ideally a snake to be present. About a week ago there was a beautiful yellow snake of some kind in the studio (some kind of boa?) i could have probably arranged for her to be on set which would have been amazing. Still, i have other ideas in this same vein, so look out for more critters in the near future. Overall, a great time, with a great model and a great set. I really enjoy doing this kind of thing in the studio, a great location is…well, great, but making a location is more fun. As always infinite thanks to Sam Minkler for opening doors and being an inspiration. Shooting on the weekends is nice, no one else waiting outside to use the studio space, and no need to wear shoes, i never shoot bare-footed, i think i will more. I will leave you with an image that is kind of a Steve McCurry shout-out, enjoy and let me know what you think. Love love love the last image. Gorgeous. Great photo’s of my daughter. It looks like you two had a fun shoot. glad you liked ’em mom, we aim to please!